The fighters and troops from the 125th Fighter Wing of the Florida Air National Guard are to go to Europe in mid-April, the US Air Forces in Europe reported this week. The F-15C Eagles are equipped with advanced air-to-air radar and sniper targeting equipment that allows visual tracking at extremely long ranges. 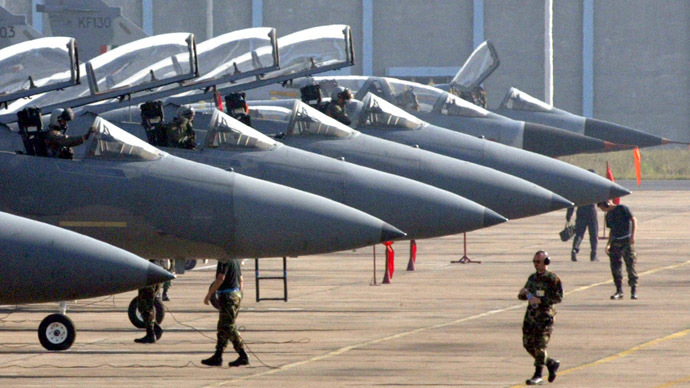 The F-15s would be sent to the Netherlands and later Bulgaria. The unit is to replace 12 A-10s from the Davis-Monthan Air Force Base, Arizona, which have been deployed since February. The A-10s is hosted at US Air Base Spangdahlem in Germany, but also visited RAF Lakenheath in UK and Poland. The deployment is a "theater security package", part of the Operation Atlantic Resolve, a series of American troops deployments and training exercises in Europe, which Washington claims is necessary to protect European NATO members from a Russian aggression. Moscow sees them as provocative and escalating tension amid the ongoing crisis over the Ukrainian turmoil. In addition to the A-10s, the Pentagon recently deployed 14 F-16s from Aviano air base in Italy to Estonia. The Florida Air Guard is the first US National Guard force to contribute to the anti-Russian operation in Europe. On the ground, the US saber rattling comes in the form of dozens Stryker armored vehicles rolling across Europe and stopping at a new capital every night.